Get your Questions Answered Now to Save you Time & Money! Are shingles included in the DIY shed kits? Shingles are not included in the DIY kits. 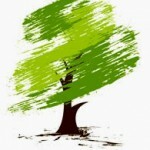 Shingle quantity varies depending on the model sold. Shingles and roofing nails are available for purchase while you’re at the store. Additional roofing material such as felt and drip edge are also available locally and can be added at your discretion. 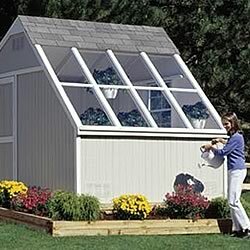 Are the fasteners and hardware included in the DIY shed kits? Yes. Framing nails, screws and door hardware is included. Roofing nails are sold separately with your shingles. Do I have to paint or stain my new shed? 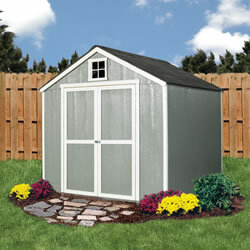 Each shed has the recommended # of gallons and quarts for the body and trim on the website as well as the brochures. The siding has a baked on primer so you will not need to prime the body of the shed. Is everything included in the kit? 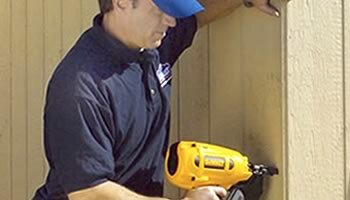 Everything is pre-cut in the kit for easy installation. However, before you leave the store, you need to purchase shingles, paint and any foundation material that you would like to have the floor frame setting on. (ie: runners or blocks). 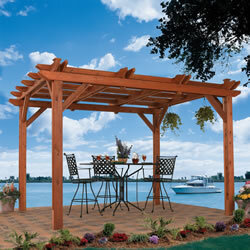 The Value Series feature a FREE treated floor frame – floor decking is sold separately. How can I get the shed kit home from the store? If it is a stock kit you can simply take it with you if you have a pickup truck or trailer. Or you can hire the Lowe’s store to deliver it. If it is a SOS order the kit will arrive at the store within 3 weeks at which time delivery can be arranged with the store to be delivered to the site or the customer can pick it up. What tools do I need to build this shed? The basic tools are required: Safety glasses, ladder, hammer, tape measure, pencil, drill, square and 6’ level. NO SAW is needed. All parts are pre-cut. Not in all areas. It is always best to check with your local city building department before you start construction. Most municipalities allow buildings to be built with no permit or with little restrictions when the building is less than 100 sq. ft.
Do I need to excavate the land where I am going to build? Not necessarily . 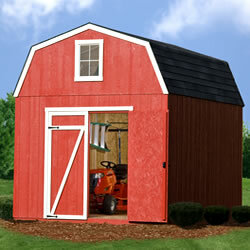 Most storage shed buildings are built right on top of the grass without any excavation. Most buildings are built using concrete blocks, treated leveling material and shims to level the floor up. You can excavate the ground and fill in with stone to get a flat surface to build on. You may also choose to pour a concrete slab. Trim back trees and shrubs to allow for 3-4’ of clearance around and above the location for ease of installation and painting your new shed after the barn is erected. Does my building meet Homeowners requirements? Most HOA’s have guidelines for what is allowed in your neighborhood and where it can be placed in your yard. The siding and roofing will need to match your home. Most will approve Heartland buildings from the pictures in our brochure. Keep in mind many municipalities also require a setback from the property lines for utility easements which is typically 5-10’. Will my shed hold my lawn tractor? Yes, most of our sheds can accommodate most lawn tractors . The Value Series features a 56-in. and 64-in. door opening. The Classic and Architectural Series features a 64-in. door opening. Our vinyl buildings feature 48-in. or 64-in. door openings. 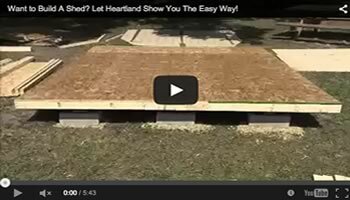 You will need to buy a ramp to get your mower into your new Heartland building. What if a part is missing or a board is broken? Heartland has a customer service hotline with customer service reps on staff 6 days a week. Contact Heartland at 1-800-577-9663 or Chat with us Online.